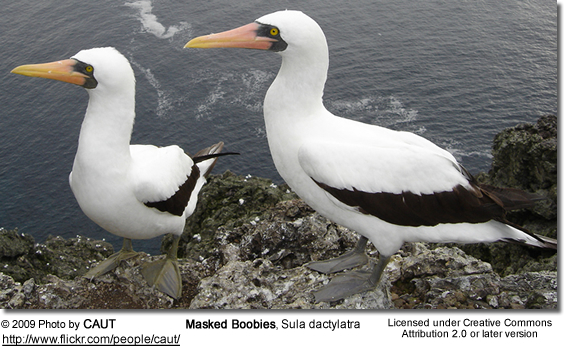 The Masked Booby, Sula dactylatra, is a large seabird of the gannet family, Sulidae. 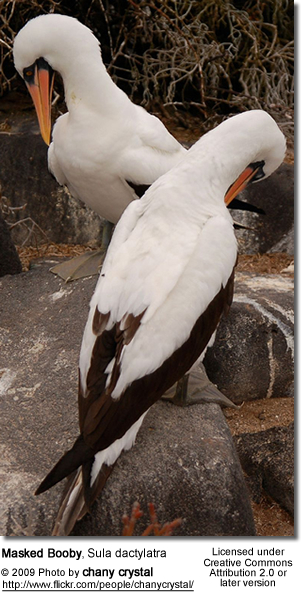 This species breeds on islands in tropical oceans, especially on the Galapagos islands, except in the eastern Atlantic; in the eastern Pacific it is replaced by the Nazca Booby, Sula granti, which was formerly regarded as a subspecies of Masked Booby (Pitman and Jehl 1998, Friesen et al. 2002). 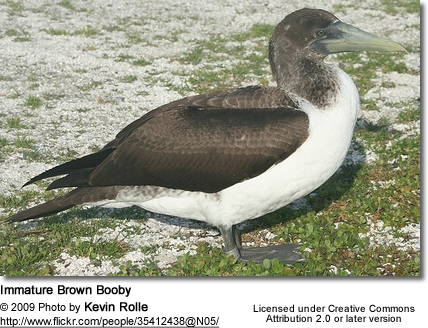 This is the largest booby, at 81-91 cm length, 152 cm wingspan and 1500 g weight. Adults are white with pointed black wings, a pointed black tail, and a dark grey facemask. 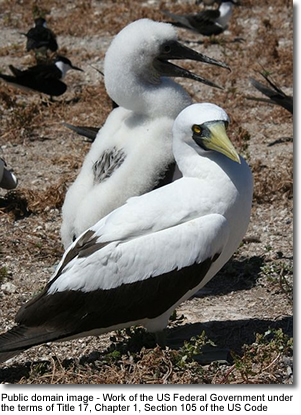 Males and females look alike, but the male has a yellow bill, and the female's is greenish yellow; during the breeding season they have a patch of bare, bluish skin at the base of the bill. Juveniles are brownish on the head and upperparts, with a whitish rump and neck collar. The underparts are white. Adult plumage is acquired over two years. 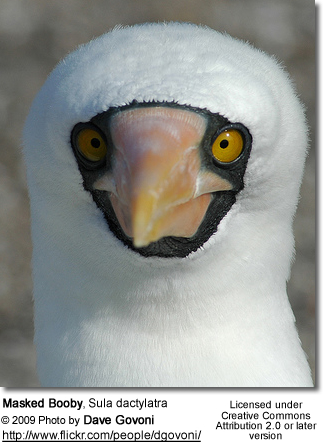 The Masked Booby is silent at sea, but has a reedy whistling greeting call at the nesting colonies. While on the breeding grounds, these birds display a wide range of hissing and quacking notes. Masked Boobies are spectacular divers, plunging diagonally into the ocean at high speed. They mainly eat small fish, including flying fish. This is a fairly sedentary bird, wintering at sea, but rarely seen far away from the breeding colonies. However, Caribbean birds occasionally wander north to warm southern Gulf Stream waters off the eastern seaboard of the United States. 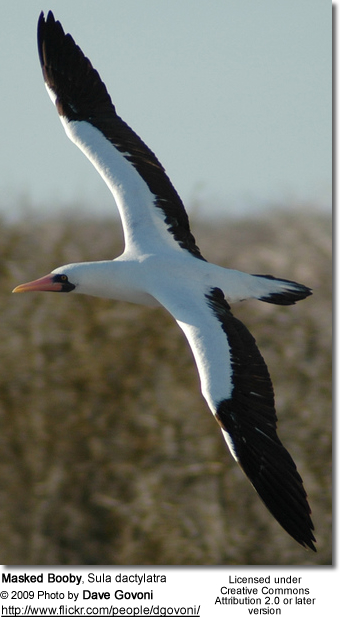 More remarkably, there have been three Western Palaearctic records of Masked Booby, presumably dactylatra, all from Spanish waters, although one of these also entered French territorial areas. 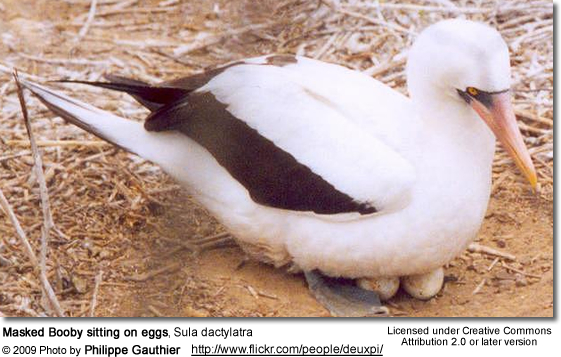 It nests in small colonies, laying two chalky white eggs on sandy beaches in shallow depressions, which are incubated by both adults for 45 days. In most cases, the first chick will kill its smaller, weaker sibling after it hatches. Siblicide has been well studied in this species; researchers such as David Anderson have demonstrated that while the boobies can manage to feed two chicks if siblicide is prevented, they do so at a steep penalty to health and future reproductive success. Breeds in the central and western Pacific and around Australia, as well as off Mexico and on Clipperton Island. Birds of the latter two locations have been separated as subspecies granti, and the NW Australian population has been named as subspecies bedouti, but neither is usually considered valid. Breeds in the Caribbean and some Atlantic islands including Ascension Island. It has recently started breeding off Tobago, formerly being known in this area only from a single sight record from an oil rig off Trinidad. Breeds in the western Indian Ocean. The form breeding on Lord Howe and the Kermadec Islands. Large prehistoric specimens known from the former and Norfolk Island are sometimes considered a distinct "species" (properly: subspecies). If this is correct, the extant population's name would be S. d. fullagari. Mack, Alison. 1997. "Natural born killers." Earth 6, no. 3: 12. General Science Collection, EBSCOhost (accessed May 4, 2007).